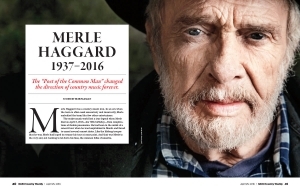 Merle Haggard was a country music icon. In an era when the term is often used excessively and incorrectly, Merle embodied the term like few other entertainers. 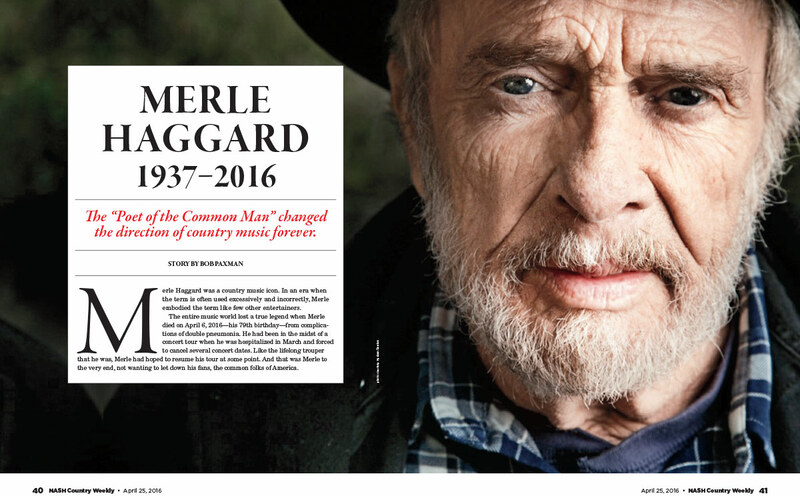 The entire music world lost a true legend when Merle died on April 6, 2016—his 79th birthday—from complications of double pneumonia. He had been in the midst of a concert tour when he was hospitalized in March and forced to cancel several concert dates. Like the lifelong trouper that he was, Merle had hoped to resume his tour at some point. 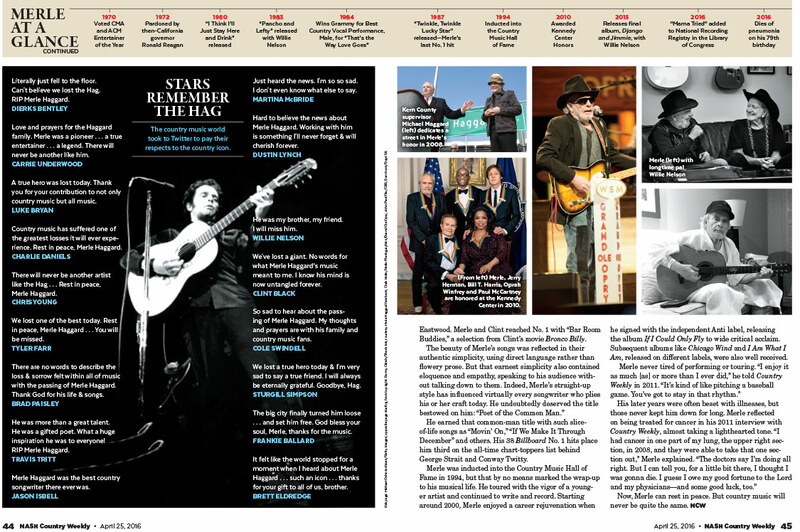 And that was Merle to the very end, not wanting to let down his fans, the common folks of America. Merle was one of them, which accounted for his undeniable appeal. He was born on April 6, 1937, in Bakersfield, Calif. He often reflected on his hardscrabble childhood, being raised primarily by his mother following the death of his father when Merle was a boy. He rebelled against his strict and stern mother, running away from home regularly and spending time in reform schools. Merle truly knew what the hard-living “outlaw” lifestyle was all about. He spent time in San Quentin State Prison in California in the late 1950s for an attempted robbery (Merle was later pardoned for his crime by California governor Ronald Reagan). 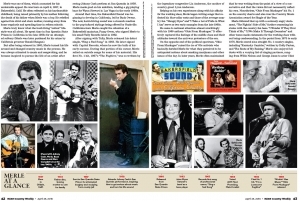 But after being released in 1960, Merle turned his life around­ and changed country music in the process. 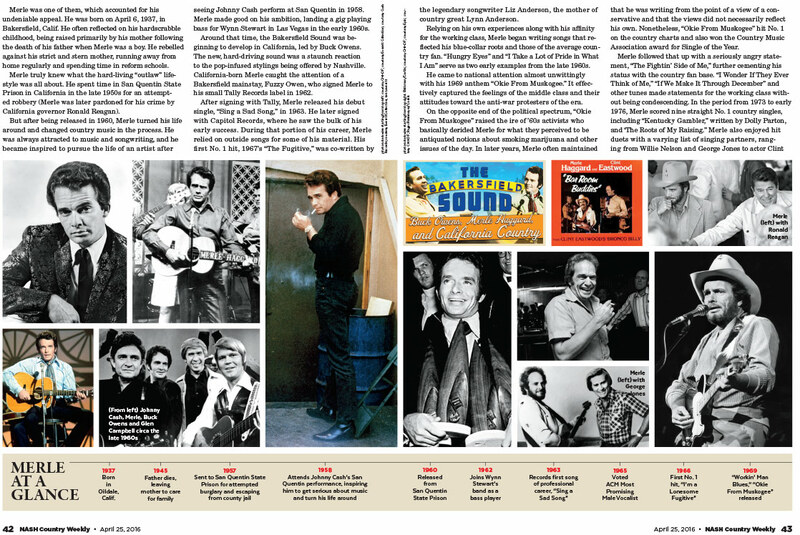 He was always attracted to music and songwriting, and he became inspired to pursue the life of an artist after seeing Johnny Cash perform at San Quentin in 1958. Merle made good on his ambition, landing a gig playing bass for Wynn Stewart in Las Vegas in the early 1960s. Around that time, the Bakersfield Sound was beginning to develop in California, led by Buck Owens. The new, hard-driving sound was a staunch reaction to the pop-infused stylings being offered by Nashville. California-born Merle caught the attention of a Bakersfield mainstay, Fuzzy Owen, who signed Merle to his small Tally Records label in 1962. After signing with Tally, Merle released his debut single, “Sing a Sad Song,” in 1963. He later signed with Capitol Records, where he saw the bulk of his early success. 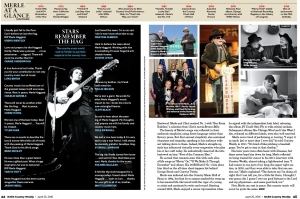 During that portion of his career, Merle relied on outside songs for some of his material. His first No. 1 hit, 1967’s “The Fugitive,” was co-written by the legendary songwriter Liz Anderson, the mother of country great Lynn Anderson. Relying on his own experiences along with his affinity for the working class, Merle began writing songs that reflected his blue-collar roots and those of the average country fan. “Hungry Eyes” and “I Take a Lot of Pride in What I Am” serve as two early examples from the late 1960s. He came to national attention almost unwittingly with his 1969 anthem “Okie From Muskogee.” It effectively captured the feelings of the middle class and their attitudes toward the anti-war protesters of the era. On the opposite end of the political spectrum, “Okie From Muskogee” raised the ire of ’60s activists who basically derided Merle for what they perceived to be antiquated notions about smoking marijuana and other issues of the day. In later years, Merle often maintained that he was writing from the point of a view of a conservative and that the views did not necessarily reflect his own. Nonetheless, “Okie From Muskogee” hit No. 1 on the country charts and also won the Country Music Association award for Single of the Year. Merle followed that up with a seriously angry statement, “The Fightin’ Side of Me,” further cementing his status with the country fan base. “I Wonder If They Ever Think of Me,” “If We Make It Through December” and other tunes made statements for the working class without being condescending. In the period from 1973 to early 1976, Merle scored nine straight No. 1 country singles, including “Kentucky Gambler,” written by Dolly Parton, and ‘The Roots of My Raising.” Merle also enjoyed hit duets with a varying list of singing partners, ranging from Willie Nelson and George Jones to actor Clint Eastwood. Merle and Clint reached No. 1 with “Bar Room Buddies,” a selection from Clint’s movie Bronco Billy. He earned that common-man title with such slice-of-life songs as “Movin’ On,” “If We Make It Through December” and others. His 38 Billboard No. 1 hits place him third on the all-time chart-toppers list behind George Strait and Conway Twitty. Merle was inducted into the Country Music Hall of Fame in 1994, but that by no means marked the wrap-up to his musical life. He toured with the vigor of a younger artist and continued to write and record. Starting around 2000, Merle enjoyed a career rejuvenation when he signed with the independent Anti label, releasing the album If I Could Only Fly to wide critical acclaim. Subsequent albums like Chicago Wind and I Am What I Am, released on different labels, were also well received.